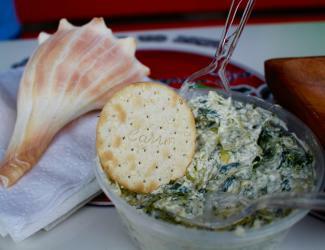 Food tours reveal culinary gems and local history in Wilmington NC and island beaches. With a region so rich and varied in food culture, where do you begin? Although we had sampled many restaurants and markets in the area, we had never taken a food tour led by a local expert. Whether you’re visiting an area for the first time or have lived there all your life, we’ve found this is a great way to learn about the local culinary scene. Two area food tours helped us discover new places that otherwise might not have been on our radar. In addition to enhancing our visit the tours also led to a new appreciation for the Wilmington and Beaches culinary scene. 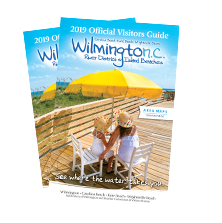 The best tour guides also incorporate some local history into the experience, which helps put the flavors into context with Wilmington and its beaches’ rich and varied past. Our first tour was with Taste Carolina Gourmet Food Tours, led by the appropriately named (for a food tour) guide, Bree. She is also a Wilmington pastry chef so her knowledge of the local culinary scene—along with her naturally bubbly personality—led to a fun afternoon outing. Bree took us up and down the streets of Wilmington’s downtown core, pointing out quirky facts (like the site of a former speakeasy), and introducing us to restaurants we might not otherwise have found. 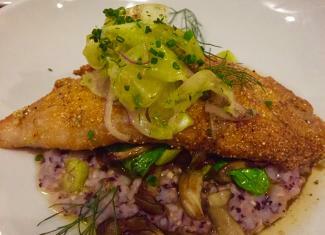 One such stop was Savorez, a modern take on Latin cuisine with a Southern twist that somehow manages to work. Twenty-seven-year-old chef Sam Cahoon is a native of Wilmington who established a top-notch reputation at Ceviche’s Restaurant, near Wrightsville Beach. (The pristine waters hugging Wrightsville Beach are also the source of Sea Love Sea Salt used to make Savorez’s outstanding margaritas.) 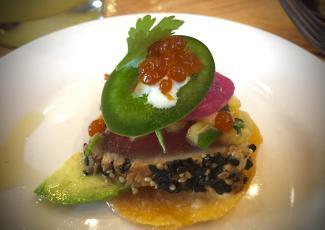 The tuna tostada on a crispy corn tortilla with avocado, pineapple salsa, pickled shallots, jalapeno and yuzu aioli made such an impression on us that we returned a week later for brunch so we could sample more of the menu. PinPoint has made a national impact in a relatively short time; opened in late 2015, the following year it was named one of the “Best New Restaurants in the South” by Southern Living magazine. 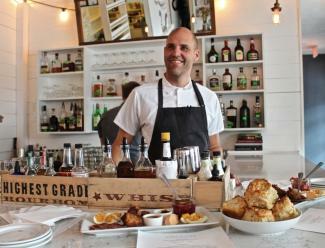 Owners Chef Dean Neff and Jeff Duckworth were working in Georgia but chose to open a community restaurant in Wilmington for the bountiful variety of fresh seafood, sourcing the catch from local fishing boats. According to Duckworth, “When we serve a fish it was in the water the day before.” The focus is on fresh wild seafood like the local flounder with sunchoke raviolis, braised green garlic, local asparagus, potatoes, herbs, lobster, and smoked cream. Just thinking about that meal got us hungry again! Good food isn’t limited to gourmet restaurants, and we like that the tour included stops in all price ranges, such as Chops Deli. Our visit made us realize there’s a bit more between the bread here than the average sandwich shop. Opened in 2009, Chops focuses on creating sandwiches with innovative ingredients and combinations like the Bordeaux that features Rare Roast Beef, French Brie, Red Onion and Homemade Mushroom Gravy on a French Baguette. Sandwiches are named after global port cities, a fitting tribute in the port city of Wilmington. As an added bonus, the establishment is a minimum waste facility; even the to-go utensils and packaging are made from bio-friendly corn products and are compostable. No food tour is complete without dessert. We finished up at The Peppered Cupcake, where they say “it’s not just a dessert, it’s an experience.” That it truly was, as all the fresh cupcakes are decorated to order. A china cabinet displays samples of the daily offerings, lit up like the finest baubles from Tiffany’s. 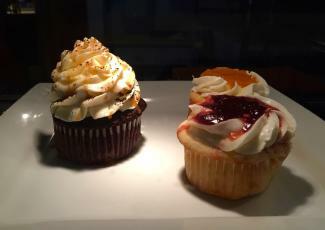 While they provide unique flavors like mango & pineapple pepper jelly and blackberry & fennel, what really lifted us into cupcake heaven was their warm cupcakes. Toppings such as peach and lavender cobbler are warmed, then drizzled over the sweet buttercream frosting. It’s the first time we’ve encountered cupcakes meant to be eaten with a spoon—yum! Normally we think of Wilmington’s beaches as a place for sun, waves, and sand and hadn’t put much thought into the range of foods available there. That changed after taking the Tasting History tour of Carolina Beach led by local residents Jeff and Brinley Christner. When we’re down South and hear the term “from scratch” the first thing we think of is . . . biscuits! You are unlikely to find better examples than the cheddar biscuits here at Surf House. They’re a mainstay of the “Redneck Picnic,” a grazing meal that includes those perfectly crispy savory biscuits accompanied with house-made deviled eggs, pimento goat cheese, salumi, spicy honey and house jam and pickles. If that leaves you wanting more, head to Love’s newest venture just up the road: the Southerly Biscuit & Pie for buttermilk biscuit sandwiches and seasonal hand pies—the cherry Cheerwine is a favorite. No beach community would be complete without that summertime staple—fudge. Our tour took us to The Fudgeboat, an establishment on the Carolina Beach Boardwalk where the display case of colorful treats is in fact the renovated hull of an abandoned wooden boat. The proprietors of this grandmom, mom, and pop business are Lou “The Fudge Lady” Belo, her daughter Tracee Hagestrom and son-in-law, the irrepressible Fudgeboat captain Duke Hagestrom. 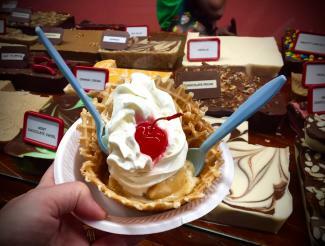 We’ve tasted more than our share of fudge at many seaside locations over the years and can attest that the creamy offerings by Fudgeboat are the clear winner. Duke emphasizes that only the freshest butter, cream and flavors go into the more than 50 varieties they produce. Our favorites are the penuche (a brown sugar version that will have caramel and toffee lovers swooning) and the chocolate pecan, which is chock-full of fresh pecan chunks. But there’s a surprise in store: The Fudgeboat also makes their own ice cream, and you can customize a hot fudge sundae with ANY of their fudges. Sign us up! Since we had already loaded up on fudge during our first visit on the food tour, we returned on Sunday for a sundae. We chose salted caramel ice cream with a maple fudge topping. Best. Hot. Fudge. Sundae. Ever!!! Wilmington and its island beaches provide a wide range of culinary offerings to satisfy any palate. The Taste Carolina Gourmet Food Tour and Tasting History enhanced our appreciation of the local food scene, while also providing suggestions for upcoming trips to the area. Insider Tips: A typical walking food tour lasts about three hours, where you’ll sample delights at five to six restaurants and markets. Each stop offers generous tastings, so it’s best to avoid eating beforehand. Advance reservations are required for both food tours, so be sure to plan ahead and book early! Larissa and Michael Milne have been full-time global nomads since 2011 and write the “Field-Tested Travel Tips” column for the Philadelphia Inquirer. With the whole world to choose from, they somehow keep ending up in Wilmington and its beaches. Follow their journey at www.ChangesInLongitude.com.